There is much speculation and anticipation about September 2015. Many of us have been researching and trying to understand the potential outcomes of events such as the coming Blood Moon tetrad, the reactivation of CERN, the UN Genreal Assembly and Operation Jade Helm 15, while others are predicting everything from false flags to the realization of French Foreign Minister Laurent Fabius’ “500 Days to Climate Chaos” prediction, from the prophesied ‘End of Days’ cataclysm to the biblical ‘Judgment Day’. On an energetic level, this is a time of unprecedented change. We are standing at a point our collective evolution in “space time” at which our life on earth and the paradigms through which we are experiencing them are radically shifting. In relation to the cycles of our solar system’s planetary movements, important astrological aspects of our last 5-year cycles are now completing at once, reflecting powerful completion on a very deep and complex level; and as a result, we will be seeing a dramatic shift in our collective consciousness taking place. On the surface, the nature of these evolutionary shifts can seem incredibly bizarre, so we would like to share some understandings in the hope of offering some practical solutions and guidance on how to navigate your way in the profound times in our cosmic evolution. The intention of this article is not to tell you what the truth is or what to believe, but to share some deep universal knowledge that will help to strengthen your intuition and empower your soul to know and recognize the true agendas behind information and events that you encounter, and to stimulate the expansion of your individual consciousness. Try to stay open-minded as you read, and allow yourself to feel how this information resonates within you. In accordance with the new emerging paradigm we would like to share some thoughts around the 3 main principles that help cultivate a grounded understanding and awareness of this universe we live in. The natural law of impermanence reflects the natural cycles of change. Everything has a beginning that eventually leads to an end. Many of us have come to truly understand this principle over the last two and a half years, amplified by the transit of Saturn through Scorpio. Spiritually, this law teaches us to value our moments here on earth and the preciousness of our impermanent lives, with all the emotions that accompany our experience of change. It also shows us our connection to everything as we all born from, and ultimately pass on to, the same place. In this dense material plane, it can be very hard work to align ourselves with the law of involution and evolution, which brings about the natural timing of life metamorphosis. To create a grounded perspective here, it is important to see that we are evolving and experiencing in cycles, and even though we would like to experience instantly and evolve in a linear fashion, this would be simply impossible. It would create total insanity. Involution and evolution works in this way. Source (us) is a journey of learning. In this journey we experience expansion and contraction, similar to the breath of inhalation and exhalation. When we experience creation as the Source of all things, we learn through expanding and exploring. Then at some point, we begin the journey of contraction, of turning inward and returning home. This is actually a deconstructive process which leads to new opportunities. Thus the cycles of creation/evolution and contraction/involution represent the natural law of our cyclical journey. We are currently moving through a stage of involution, deconstructing our reality as we return home. This can be seen all around. The law of Karmic Return brings us into awareness of how we direct our motion of energy. This law reveals to us the nature of Cause and Effect, and that if we act out of balance, we will be shown the opposite effect. Currently amplified by Pluto in Capricorn (from 2008 to 2023), our reality is revealing to us how our past actions have brought us to the current state of the planet. It is so important to see that, on a very deep level, this is a very dark place far from home, so our collective journey back home cannot be done easily, or overnight. It will go on for many years. Our purpose right now, individually and then collectively, is to actively participate in clearing our karma by spending time seeking out aspects of ourselves that cause discord and disempowerment, healing them, and then bringing our knowledge and insight into the world in a way that helps to raise and heal the collective consciousness. As we embark on this amazing path of self-empowered awakening, it helps to take into consideration that our sleep-state aids our awakening state — that our current awakening could not happen were in not for our slumber. Through the law of impermanence and the law of involution/evolution, we have become aware of our karmic story as a collective, and our own individual stories. This awareness is leading us deeper into our authentic connection to Source, and to the emotional sensitivities of unity, empathy, forgiveness and acceptance. On an astrological level, the karma of this deceptions is reflected to us by the transition of Neptune through Pisces, from the end of 2011 to 2025. The archetype of Neptune is associated with illusion and deception, and this 14 year cycle through the sign of Pisces culminates Neptune’s lengthy 147 year cycle around the zodiac. In essence, the entire Piscean Age of Duality is coming to completion, a cycle which (defined by the sun’s position at the time of the vernal equinox) lasts around 2000 years. Notably, the bible speaks of “revelations”; we believe it is referring to these planetary alignments, not specifically but in reference to the cycles of illusion and illumination they symbolize. Currently on this earthly time line, deception plays a big role in keeping us away from finding true empowerment. Our lives are constantly influenced by deliberate deceit, distractions and misdirection. These influences have become increasingly more influential as the Age of Information — and as a result of Karmic effect, the Age of Misinformation — becomes a part of our collective consciousness. As more awareness pours into the collective consciousness, the more invasive the false light becomes available. So what is false light? False light in the context of this dialogue is information that distracts people from the true meaning of their nature; any information that does not promote self-empowerment and the realization of the Self, including spiritual teachings that promote our attachments to illusions and the externalization of power. The aim of false-light is to shift your awareness away from what is truly important; maintaining an honest and direct connection with Source. The influx of fear propaganda is pushing many people to feel that they are helpless and that, in order for the human race to survive, we need 1) an external savior to fix our problems and 2) a “heaven” (elsewhere) to which we must ascend, in order to leave all this distortion behind. There is so much danger in this. Firstly, our survival instincts are being triggered by fear propaganda and brought to light in such a way that it would seem impossible or ludicrous to not accept such a savior, preparing the human collective to accept a false savior following another stage, fear-inducing false flag event. Secondly, the notion of an external savior encourages complacency and inaction by precipitating the belief that we can sit and do nothing, and everything will somehow correct itself. In truth, we have to come to understand that life is not an easy journey of idealism; that we do have to face situations and evolve through circumstances that humble us, and that we – not an external entity – need to make the difficult changes in our lives that will actually make an impact and help to correct our current imbalances and distortions. This processes of us finding new solutions to our outdated systems and infrastructures means waking up every day and saying: I am here fully present and I choose soul empowerment as my journey through this lifetime. Soul empowerment and being fully present means taking responsibility for our individual karma and, through that, being present to heal our collective karma. This is powerful because it says: I take my life and journey into my own hands and I live from a space of leadership for others souls to be inspired and to make changes in their own lives. This is the basis of true metamorphosis. It is the opposite of the “external savior” mentality, which says: I place my life in the hands of another and will wait for positive changes to be made on my behalf. It is this same externalization of power that led us to where we are today. We have collectively allowed governments to enforce their will onto people, rather than enacting the will of the people, and we have allowed religions to impose hierarchies, rules and false figureheads between people and their experience of their spiritual lives. The Catholic Church’s positioning of the Pope as “God’s representative on Earth” is a prime example of such a figurehead. So, understanding the new paradigm of self-determination we are shifting into, the tools and experiences we need to move through this time frame must be constantly strengthened, so as to avoid being fooled into false-light deception that promotes fear and stimulates misdirection in our search for true enlightening experiences. We must accept only that which reflects our inherent sovereignty, while seeking out and promoting empowering situations that contribute to the overall health and benefit of our own lives, and through that, the future of humanity and the collective of life on earth. It is also helpful to see that in every situation and circumstance lies potential empowerment or disempowerment. This understanding comes from observing whether any given situation is serving your highest good or not. Your highest good can only be decided by you, as each of our situations, circumstances and impulses are unique. And since we have been taught all our lives to accept external authority, deciphering what is in our own highest good can feel like a big task — but again, it comes back to choice. Do you wish to experience more abundance, growth and emotional strength? Or scarcity, constraint and passivity? When we look inside of ourselves and pay close attention to aspects of ourselves and our past that carry pain, trauma or self-sabotaging impulses, we can begin to align ourselves and our personal energy in a way that offers new situations and experiences — experiences that help us heal those trapped, wounded aspects of ourselves. By going deep within our emotional wounds, and healing them with love and self-understanding, we are able to become more empowered, whole versions of ourselves. This in turn leads to many more positive, life-affirming emotional experiences. Truly, the only way out is through. In contrast, the role of deception is to keep us away from seeing that truth. By feeding our trauma and pain, and in turn feeding off our trauma and pain, deception allows for the current system to stay in place. By engendering fear, hatred and separation in place of love, understanding and oneness, deception keeps us trapped in our pain, individually and collectively, and we are unable to stand in our power. It is only by seeing ourselves as a sovereign energetic being of timelessness that we break the matrix code and transcend the shackles of our feelings of disempowerment. By embracing sovereignty as our reality, we then begin to interact with systems of control and hierarchy in a way that is not supported by you but rather can be used by you to empower yourself and others. At this time it helps us to remember; the nature of our reality is cyclical, so view these cycles of light and dark for what they. Our current awakening could not happen were in not for our slumber. Try not to dwell on the sovereignty and freedoms that were previous taken or withheld from us, but revel in the amplified joy of regaining them. Another important tool to use as we integrate more self-empowering light in our awareness is the Universal Law of Polarity. In polarity we come to understand ourselves, and our relationships, with both individuals and structures, reflect this understanding very clearly. We learn the value of goodness by experiencing bad, and we learn of joy through experiencing pain. Light and dark, on and off etc. Another way to see this is the polarity of the breath. We breathe out (exhale) then breathe in (inhale). They are both of the same thing, we cannot breathe by just inhaling, or exhaling. Like the Natural Law of involution and evolution, polarity creates the whole, and both need to be fully integrated in order for us to experience unity. Unity is the total of everything. As we share this, we would like to bring into awareness the division that exists between science and spirit. This perceived division exists as a result of an unbalanced and disconnected left and right brain. People who are left-brain orientated lose out on experiencing the magic that is the soul by choosing to be invested only in the practical details of life. People with a heavily invested right-brain struggle with practicality and remaining grounded in their physical lives. In reality, both need not only to exist, but to co-exist. It is no accident we are born with both left and right hemispheres, and it is only through imposed division that we have learned to disengage the two — through our indoctrination into a society dominated by the left-brain yang energy and ruled by an elite patriarchy. Without the integration of left and right – yin and yang, masculine and feminine, seen and unseen – we can only live in discord with the totality of reality, and each other. As even quantum physics is now proving, the perceived division between the mystical and physical worlds simply doesn’t exist. And so, as we move into the timelines of the future it is imperative that we find ways to balance ourselves, and re-assimilate left and right so we may experience wholeness in our lives. Exercise: To begin this process of integration, you may begin by applying your natural sense of openness and intuition (right-brain hemisphere) to all things, and then through the left-brain hemisphere, actively discern what information or perception is practical and/or empowering for your current situation. Alternatively, you may begin by perceiving the individual functions of the mechanical world around you (left-brain hemisphere) and then allow yourself to being feeling the connectedness and universal intelligence of all things. As humans, we are capable of wonderful things. We are creators. However, if we choose to disregard the natural laws of our universe rather than allow natural law to flow through us, we create karmic foundations that will eventually show us that we cannot live outside these laws — the polarity of cause and effect — just as we see in our society today. And so, science and spirituality, left- and right-brain, must learn to work together again. And we do this by understanding natural law and aligning it with our scientific endeavors. Only by doing this we build sustainable structures that are aligned with nature and what nature teaches us. As we begin to question the nature of our reality and uncover the untruths and deceptions we have been subjected to, it is natural to find ourselves in a space where we do not know what to believe. Many of us have begun to take apart every aspect of our reality to a point that we are questioning our very existence, why we are “here” and indeed, where we are in the first place. It is an essential step in our awakening to remove the layers of belief from our consciousness so that we can be open to perceive reality in a pure and undistorted way, much like the perception of a child. As we do this we also open ourselves up to the possibility of thatanything can be true, and for most of us, this openness leaves us feeling vulnerable as we navigate further into the depths of our Being. So how do we keep an open mind and entertain the possibility that anything can be true without deceiving ourselves or getting lost in the darkness? First, we must develop our ability to discern what is relevant for us at this point in our personal journey. We must keep ourselves open to information that we are drawn to or which we have attracted to us, and humble ourselves to the possibility of learning more about ourselves and the universe while disregarding anything that is not of our current vibration, and that which we discern as false. As we attune ourselves more and more to this approach we will begin to see that everything and everyone is our teacher; that as within, so without. 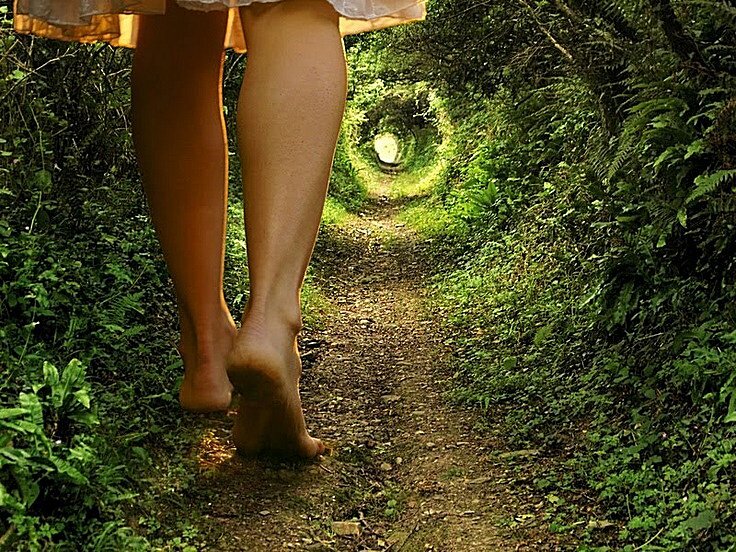 In order to stay grounded while venturing down the rabbit hole of existence, it is vital to align ourselves with the natural laws of the universe as our guidance. The way we collectively live is not in line with natural law, yet we still exist within them. The physical reality we live in is subject the laws of cause and effect, and although we have lived in ignorance of this law, reality is catching up with us and that ignorance is becoming possible. And so, once we align ourselves with these natural laws and fully understand that as above, so below, as within, so without, we will find that the answers to everything that is being reflected to us in our journey of evolution and involution. We see those answers in nature, and we know them within ourselves. Our ignorance of natural law is clearly seen in the hierarchical structures we have put in place. We have created man-made structures in which God is at the top of the pyramid, judging our actions and our very humanity as sinful. In this structure, the only way to “redemption” is by worshiping an external entity that is said to exist outside of ourselves, by following man-made doctrines, and submitting to the hierarchy. We can also see the same kinds of hierarchy in our general society, where governments rule over people, and within the ruled class, adults rule over over children while also demeaning the value of the elderly. Another example that clearly demonstrates to us the hierarchical structures of our society is how we farm sentient animals for food (energy) in the same way that the governments of the day treat their people — as commodities. According to man-made (not natural) law, we are only allowed to exist within the constructs imposed by our rulers. We give them energy in the form of money, tax, labor etc. and we are given just enough to sustain our own survival but not enough to thrive or break free of the system of energy harvesting. And we do exactly the same thing within the food industry. Think about it! According to the law of “as within, so without”, this same hierarchy exists within us too. We are taught not to question the notion of hierarchy but to strive to reach the highest place within the outer hierarchy, and in doing so we learn to feed off of others as we are fed from ourselves, which in turn keeps these structures in place. We learn that to be socialized, our inner child must give way to the authorities of our society. We learn that we must act a certain way, follow the rules, go to work… and we learn that, to live a life of creative freedom, natural abundance and exploration in accord with our inner child — our innate nature — would be irresponsible, selfish and ridiculous. If you find it difficult to imagine that there could be such malicious intent as to keep humanity enslaved for the benefit of hoarding our energy (materially represented as money and debt) then you need look no further than how you yourself uphold the very same structures for your own benefit and comfort. Think about how you contribute to the societal hierarchical structures in your everyday living. Ask yourself how you would feel if they were no longer available to you. These structures do not support a balanced energy exchange, rather they force us to feed off of the energy of those “below” us in the social order. This is how the man-made law “Survival of the fittest” is constructed. And to accommodate ourselves into this structure, we learn to suppress our creative, free and inquisitive selves, instead fostering the “skills” of compliant and socially-expected/accepted behavior. Once we have awoken to the reality of the current state of the world, we finally find that we have choice. It is easy at this point to look around and pass judgements on the distortions we find around us, to make predictions of outcomes, and to relate them to prophecies of the past; but this is not the way to bring about change. The true change is one that can only begin from within. 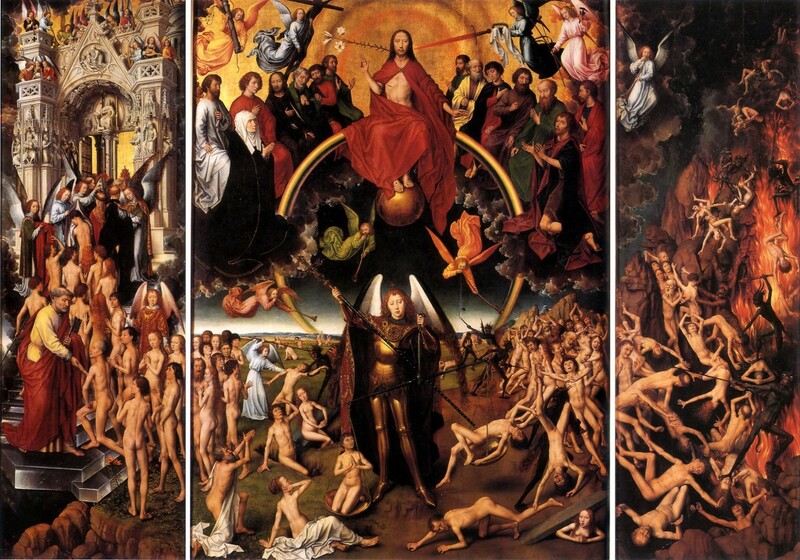 With this understanding, “Judgement Day” is the symbolic representation of the internal experience of waking up to our own ignorance; the realization that we have allowed ourselves to contribute to the pain and suffering of others and the desecration of our sacred Mother Earth. “Judgement Day” is not the act of an external being passing judgement down upon us; it is the process of our own inner discernment finally aligning with our intuitive knowing. The melding of left- and right-brain; yin and yang; above and below. It is the collapsing of distortions, and seeing ourselves as we truly are. This can be a difficult experience because, as we begin to take responsibility for our actions, we must confront our own dependencies on the very system we wish to remove. But if we are to create true, life-affirming change, we cannot live within the comfort of the system, feeding it with our energy, while simply pointing out the distortions within it. Real change begins deep within us, and the removal of our attachments, beliefs and habits that contribute to the destruction and suffering on our planet. As uncomfortable as this may feel, it means letting go of our securities and luxuries that have resulted from our imbalanced, unnatural existence, and finding new ways to exist in the world; to take full responsibility for ourselves and make the necessary changes to align ourselves with natural law. Some have already experienced this “judgement day” and have begun to disconnect from the system. Some will only realize once the effects of their actions catch up with them, according to the law of karmic return (cause and effect), triggering their understanding of the law of impermanence and deepening their connection to the universal consciousness. But ultimately, as our evolution and involution continues, all will be judged — by their own inner knowing — and only then will real change begin to happen. As we each begin to remove the hierarchical structures within ourselves, as a natural effect, those who seek to impose hierarchy, manipulation and deception upon us will inevitably amplify their attempts at control. And that is precisely what we are seeing with current world events, such as Jade Helm 15 and the continued encroachment of the United Nations on personal and national sovereignty. And yet, concurrently, and by the same law of cause and effect, we will also remove ourselves from the current man-made systems of control and distortion, as we collectively deconstruct those hierarchies within ourselves. As cause and effect plays out, they will attempt to tighten the hierarchy-driven controls over our being while we continue to assert our inherent sovereignty, helping to rebuild ecosystems and creating renewed communities in which the energy exchanged by all life is in direct relationship to its true intrinsic value. And as we do, giving no further energy to the unnatural systems of man, we will watch their imbalanced values and structures crumble and disappear into history. So, in this journey and our pursuit of truth, the best thing we can do is to stay grounded in our understanding of natural law. It gives us the tools we need to discern distortions and misleading information from the truth — the natural truth. And, as we learn to walk the walk of truth, we will reflect a different way of being to those around us, and resonate a new vibration in the field. We will be asked to share our knowledge and experience by those who are ready, creating the ripple effect and inspiring change, rather than trying – in vain – to force it onto those who aren’t ready; those whose Judgement Day has not yet come. What ever the future holds, know that we are here to aid a shift of consciousness and that everything we do inside ourselves will be reflected outwards, through both our actions and our personal vibration. We are leaders for a new paradigm. The best thing we can do right now is to empower our own lives; by cultivating our deep inner knowing, integrating our intuition (right) and logical (left) functions, developing our teaching learning and guidance skills, and finding the courage to step outside the box. Don’t wait for the change… be the change you want to see in the world.